The Unite Against Fascism 2012 conference on 25 February (at Conway Hall in London) was a chance for antifascists and antiracists to plan their campaign for the coming year. Antifascists have staged successful mobilisations against the English Defence League around the country and this year also saw a successful campaign to boot the fascist British National Party out of Stoke-on-Trent and other key areas at the local elections. But the threat of the EDL – now turning its violence against trade unionists and the left as well as Muslims – has not gone away. And now it has teamed up with BNP splinter group the British Freedom Party, creating a new alliance with both an electoral wing and a street thug movement – the classic two-pronged fascist strategy. Hundreds of antifascist and antiracist activists, campaigners and trade unionists came together today at the conference to discuss our strategy for 2012. 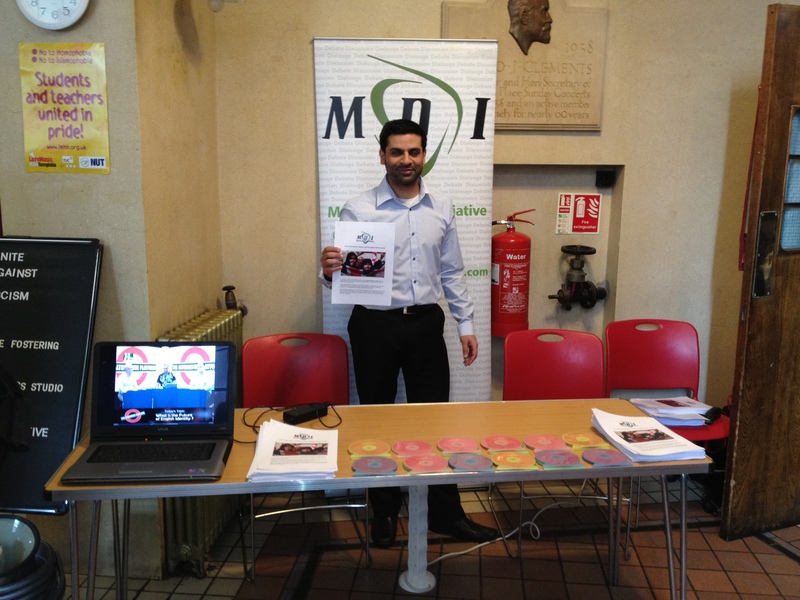 The Muslim Debate Initiative was proud to have a stall at the conference and spread the word about how we seek to challenge and refute EDL ideology in fair and public debate. 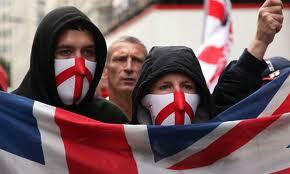 EDL argue that they have not been given a fair chance to express their ideas; they also argue that Muslims wish to silence criticism of Muslims and Islam. Therefore, in the 1,400-year Islamic tradition of open discussion, it is members of the Muslim community who have openly invited the EDL to express their views. 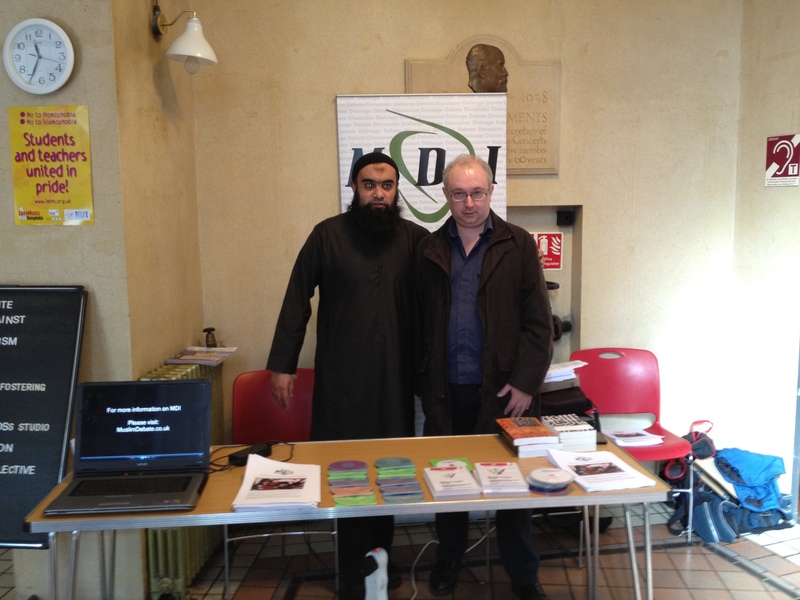 MDI have a proven track record of inviting controversial groups on to our platform in the past. These include fundamentalist evangelical Christians, militant Atheists, Secularist campaigners and the British National Party. 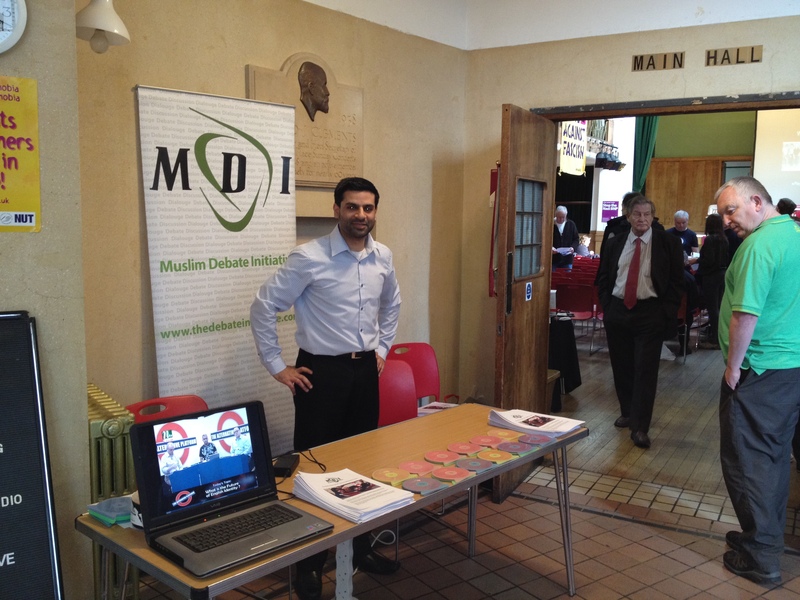 Throughout, MDI has successfully ensured peaceful, fair and civilised events, and has received numerous commendations from invitees. As Muslims, we welcome criticism and debate. If someone should hold issue with Islam or Muslims, they have a right to express their views, as long as they accept other peoples’ right to disagree with them and debate those issues. The Muslim Debate Initiative commends the campaigns of Unite Against Fascism in tackling the racist, fascist and Islamophobic views of the EDL. 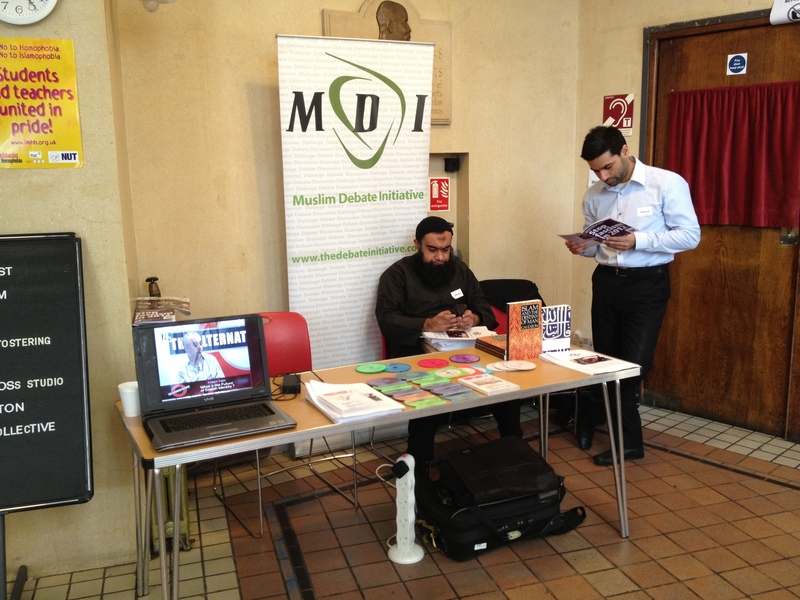 Our stall at the conference offered delegates free DVDs of MDI’s live TV debate with a member of the English Defence League on the question of ‘The Future of English Identity’; copies of the Quran in English; Gai Eaton’s Islam and The Destiny of Man; and a colour brochure detailing MDI’s attempts to debate the leadership of EDL (who chickened out of the offer). 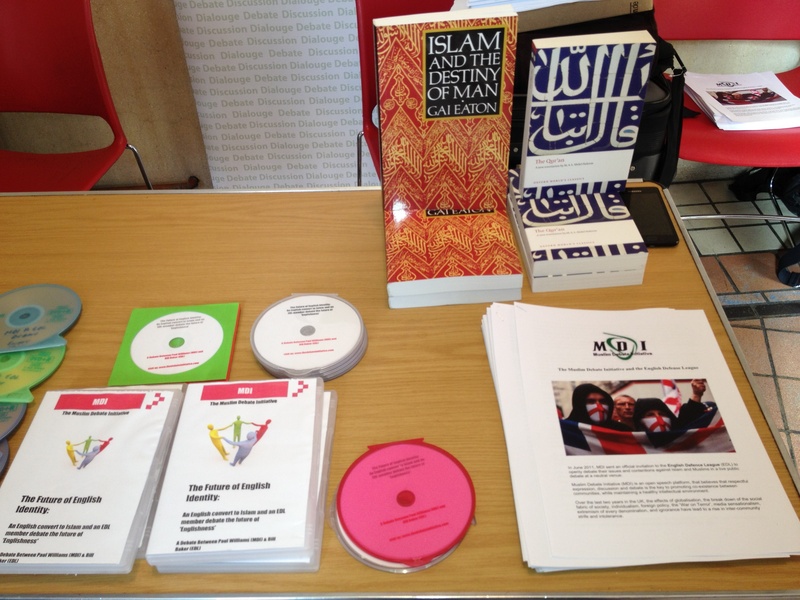 our DVDs, books and MDI brochure. At the end of the conference virtually everything had been taken by delegates.